It's easy to add and remove tags and notes to any of your applications in Aptrack. This allows for easy sorting and efficient management of your candidates. or whatever criteria you are searching for. To enter your tags here, simply type into the box and hit return after each entry. Add tags to your candidates as you feel necessary, you may add as many as you like. To delete, just hover the mouse over the tag and click the 'x'. 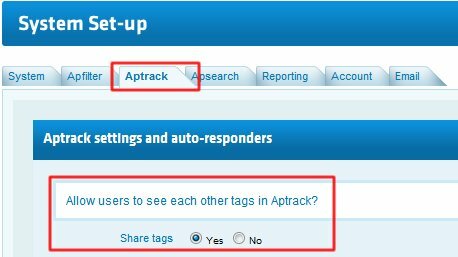 When multiple candidates have been tagged, you will see them listed in the tag management section, at the bottom left of the Aptrack screen. You will now see a list of tags that you have created. Selecting any of the headings will show all candidates that have been given that particular tag. The image below shows all of the applicants in the display window that have been given the 'sales' tag. If you are looking for candidates with a particularly strong sales background, you may now view all of these applications in one place. 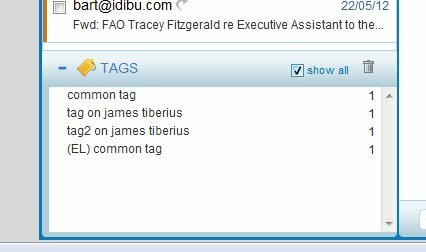 Tagging your candidates takes seconds, and allows you to get straight to the relevant applications next time you log in to idibu. You may simply move through the groups as you wish. It's easy to update or change these groups. To delete, just highlight and select the 'trash' icon. afterwards the tags section will have a dedicated checkbox that will call other consultant's tags, provided the chosen applicant has any assigned. Tags from other consultants will be marked with their initialis.